You will be given a reference e-book to read which has 352 pages And the test will be based on that e-book , you can take the test only after 10 days Of &nbsp;purchase. Identifying different risks is highly important to be able to avoid any potential problems because of such risks. Many businesses cannot afford to have any pitfalls due to such risks and it is highly essential for the success of such companies to foresee various risks. In this era of highly competitive business environment, it is highly essential to assess, evaluate and address various risks involved in running a business. There are risks involved in different sectors of business starting from investment, planning and operation. There are risks in human resource of the business which also needs to be addressed carefully. 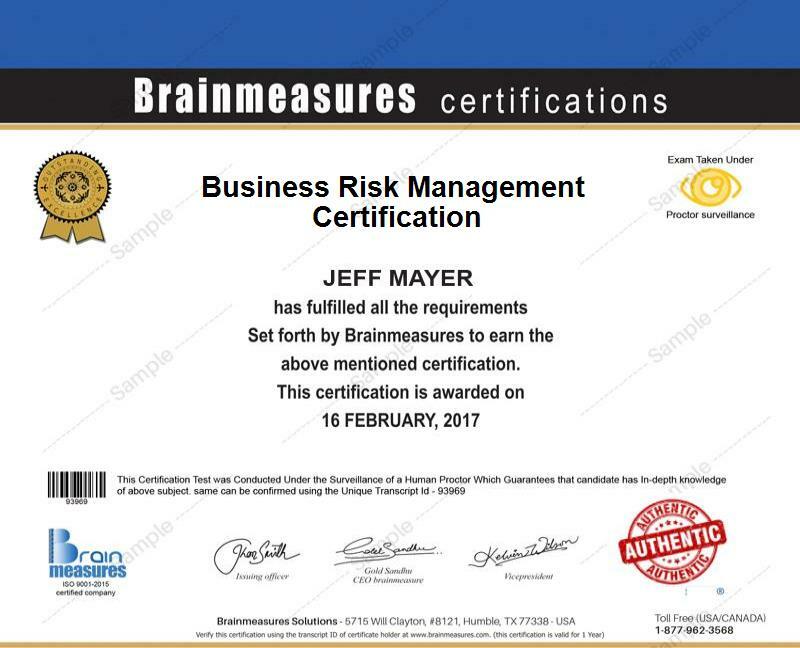 This online business risk management certification course will give you a better understanding of such risks to be able to address them better. This business risk management course is structured in 8 different parts that covers the different risks involved and how to manage them effectively. The first two chapters give you a general idea of business risk management by identifying different risks involved in different parts of any business. You need to know how to measure such risks in order to better address them and this is also covered in this initial section. A whole section is devoted for covering in detail ERM or what is known as Enterprise risk management. It details the different techniques involved starting from reward creation to even controlling different hazards in the enterprise. There are different standards or tools involved managing risks and such tools are discussed in the following section. AS/NZS 4360, IRM/Airmic/Alarm Risk Management Standard and COSO from USA are covered in detail in this section. AS/NZS 4360 gives you a comprehensive approach for any practitioner to assess and address risks while IRM gives anyone a very simple guide on how to address these in simple language. You will get a more authoritative approach from COSO and various newer tools evolving are also touched upon briefly in this section. The next section will cover the critical components of risk management such as choice, sustainability and people. There are different choices available for any business and a successful risk management involve assessing different risks involved in each of this choices and making the smart choice after evaluating and addressing them. It is very important for any business to sustain its success to be able to meet its long term goals. Evaluation of long term goals is very important to be able to achieve this and it is equally important to recognise that there are certain factors that cannot be controlled. People management is very important for the success of any business and there are major risks involved in managing people as well. One chapter is dedicated for top managements to address strategic risks and corporate governance. It gives you real life examples of different companies from different industries on an international level. There are certain risks involved in innovation and expansion of any business and such risks are also explained in detail in the next chapter. Chief Executive Officers, Managing Directors, Chief Financial Officers, Directors, Chief Technical Officers, Controllers, Business development managers, Professionals or anyone involved in managing any kind of business will benefit from this course. Disaster management professionals, risk managers, etc. will also benefit from this course. After attending this online certifications course, you will be able to attend online business risk management exam after which you will be certified. As a certified professional you will be able to foresee the various risks and avoid potential pitfalls that could occur due to such risks. You will be able to manage profitability in your business by applying various techniques of risk measurement. You will be able to better understand any irregularities in your accounting and how it could impact the company’s profits. Another huge benefit is that you are able to identify certain credit risks that is inherent in your business and will also be able to understand its implications if they are not addressed. Newer business opportunities can be identified quickly and such opportunities can be exploited well to boost the business further. You will be able to better understand the various contracts of business and identify any loop holes in such contracts to be able to make better negotiations with your customers and partners alike.